Head: ample and long lasting. Aroma: malty, with hint of floral. Taste: black coffee with a hint of caramel; some hop bitterness in the finish. Color: dark brown, a slight shade lighter than Guinness. Head: small, brownish white; collapsed quickly (see photo at top, taken shortly after the Brooklyn stout was poured; the Guinness had been poured earlier). According to the brewery's website, this stout differs from Guinness and other widely marketed Irish stouts in that no nitrogen is added to enhance the head. Aroma: floral, with a hint of berries. Taste: initially tart and fruity; no strong coffee or chocolate taste (my wife, trying it without having had Guinness first, said she tasted chocolate; perhaps my palate was skewed by having just tasted Guinness). A pleasant but subdued hop bitterness at the finish. The verdict: not a real contest, as these are very different beers. 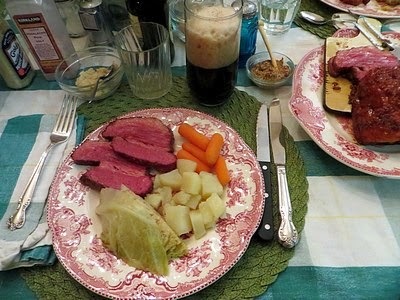 I like them both, and they went equally well with our corned beef repast. 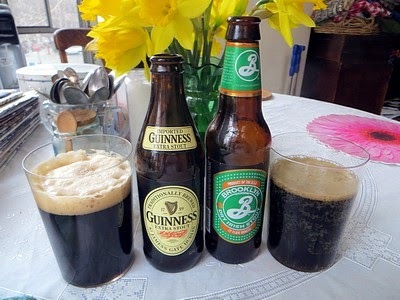 Brooklyn Brewery also makes a Black Chocolate Stout that might make for a better head to head (as it were) comparison to Guinness.